Postmedia mysteriously pulled down an online article that critiqued Westbank's pre-sales pricing at the JOYCE condo development. Though the article was printed on October 20th, all traces of it disappeared from Postmedia's online properties, including social media. Postmedia claims that there were inaccuracies in the article and even issued a printed apology to Westbank. There are allegations that Westbank pressured Postmedia to delete the article. 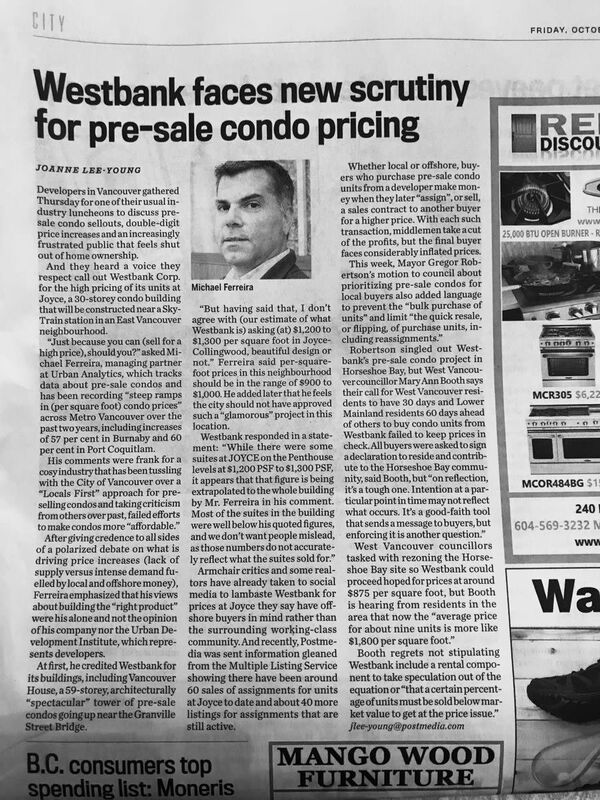 The article contains quotes from Michale Ferreira of Urban Analytics who questions Westbank's decision to charge exorbant price per square footage at their JOYCE condo development. Ferreira also states that the City of Vancouver "should not have approved such a “glamourous” project in this location" that is the Joyce preccint, a working class neighbourhood in Vancouver. This critism comes at a time when Westbank is trying to rebrand itself through its Fight for Beauty exhibition, as a "culture company" that brings "beauty" to communities with their condo projects. The JOYCE development is a prime example of artwashing by Westbank. We must fight against corporate censorship of the free press. Therefore, for records sake, here's the full text of the deleted article obtained from the handy Wayback Machine. Developers in Vancouver gathered Thursday for one of their usual industry luncheons to discuss pre-sale condo sellouts, double-digit price increases and an increasingly frustrated public that feels shut out of home ownership. And they heard a voice they respect call out Westbank Corp. for the high pricing of its units at Joyce, a 30-storey condo building that will be constructed near a SkyTrain station in an East Vancouver neighbourhood. “Just because you can (sell for a high price), should you?” asked Michael Ferreira, managing partner at Urban Analytics, which tracks data about pre-sale condos and has been recording “steep ramps in (per square foot) condo prices” across Metro Vancouver over the past two years, including increases of 57 per cent in Burnaby and 60 per cent in Port Coquitlam. After giving credence to all sides of a polarized debate on what is driving price increases (lack of supply versus intense demand fuelled by local and offshore money), Ferreira emphasized that his views about building the “right product” were his alone and not the opinion of his company nor the Urban Development Institute, which represents developers. At first, he credited Westbank for its iconic buildings, including Vancouver House, a 59-storey, architecturally “spectacular” tower of pre-sale condos going up near the Granville Street bridge. Ferreira said per-square-foot prices in this neighbourhood should be in the range of $900 to $1,000. He added later that he feels the City should not have approved such a “glamourous” project in this location. Armchair critics and some realtors have already taken to social media to lambaste Westbank for prices at Joyce they say have offshore buyers in mind rather than the surrounding working-class community. And recently, Postmedia was sent information gleaned from the Multiple Listing Service showing there have been around 60 sales of assignments for units at Joyce to date and about 40 more listings for assignments that are still active. Whether local or offshore, buyers who purchase pre-sale condo units from a developer make money when they later “assign”, or sell, a sales contract to another buyer for a higher price. With each such transaction, middlemen take a cut of the profits, but the final buyer faces considerably inflated prices. For now, the development industry is also turning to engage the province, which charges a so-called foreign buyers tax of 15 per cent on residential homes sold in Metro Vancouver, but exempts this charge on pre-sale condo contracts sold by developers. UDI this week submitted to the province a “pre-2018 budget” document related to pre-sale condo sales that “affirms our industry wants to ensure that everyone pays their share of taxes and that any potentially fraudulent activity is eliminated.” It also said Thursday that at its next luncheon, the speaker will be NDP minister of municipal affairs and housing Selina Robinson.